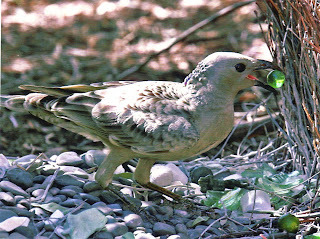 Bower bird: Australian male birds build a bower - or nest- to attract mates---a collection of look-alike objects that are carefully collected, sorted, and arranged by color into spectacular structures, often including hundreds of shells, leaves, flowers, stones or berries. Hoarder: a person who accumulate things and hides them away for future use. Collector: a person who collects things. Stylist: a finder, keeper and curator of beautiful objects. 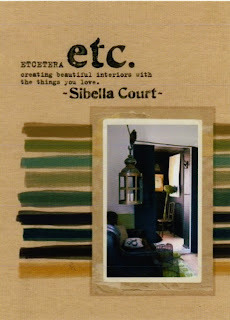 Sibella Court, a collector, stylist, interior design artist from Australia writes about bower birds in her fabulous, wonderful book ETCETERA: creating beautiful interiors with the things you love. 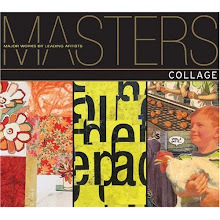 Her book is like an artful altered book of collages with beautiful photos and imagery. 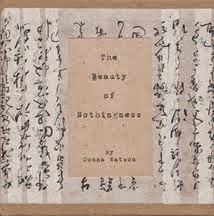 Her text is typed with an old manual typewriter with rubber stampings and collage elements throughout. She bases her designs on themes and color combinations of her collections. She also has a website called THE SOCIETY INC. which you can find here. You can go to her website for information and links on how to purchase her book. 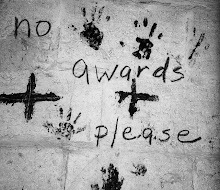 You will also find more images similar to what you will find in her book. Also, check the website www.anthropologie.com from time to time for availability in the USA. 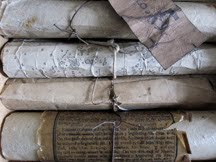 "I like to collect things that speak eloquently of their history" -- Gail Rieke. 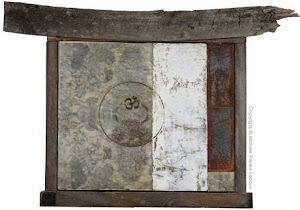 Gail works with Asian assemblage and wrapping nature based objects, and you can find her website here. "Objects stored on open shelving and found upon doors take on new appeal when blessed with the uniformity of colour, because whats the point of possessing beautiful and meaningful things if you can't show them off for the world to see?" --- Sibella Court, from her book ETC. "The pleasure is in choosing the new road, pointed by a single object, and in gaining the insight of discovery along the way." Keith Lo Bue. 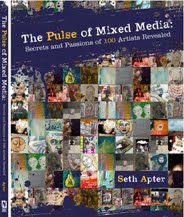 Keith incorporates his collections, collage and assemblage into his fabulous jewelry and you can find his website here. Graceann Warn "reveals that there is a strong visual thread between her home decor, her artwork, and even her clothing--as she defines it-- total connection." 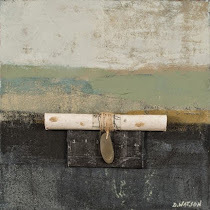 Graceann works with encaustic, collage and assemblage and you can find her website here. "For me, a home is like a museum without the signs saying 'Please Don't Touch.' Think of all the stuff you own that has emotional or historical significance or comes with a memory or tale of where, when and who." ---Sibella Court, ETC. There is a wonderful store in Soho, New York City, called The Evolution Store. You can find fossils, bones, skulls--both real and replicas-- minerals, insects and much more. You can find their website here. All this is a glorious feast to my eye Donna. Your space strikes me as peaceful, serene and infinitely interesting. 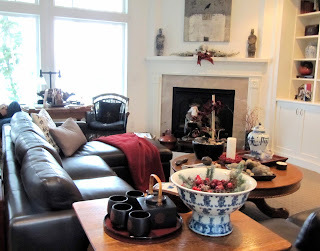 I think the number one unifying element is color.I love homes with good things to look at, to read and to be with. 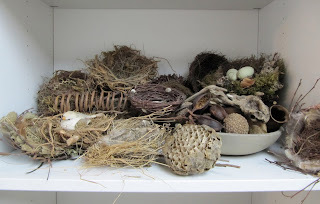 Going through my studio today, I found a square nest - the bird built its nest on a shelf in a small shed. Perfect for a box assemblage. The things we collect speak volumes about us, don't you think? Beautiful, beautiful post. A fantastic post Donna, as always. I think there can be a fine line between collecting and hoarding. But whatever you want to call it, the images from your home here are absolutely stunning. You also highlight quotes from some of my most favorite artists. I had the pleasure to have spent some time with Gail Rieke in her studio and, well let's just call it nirvana!! 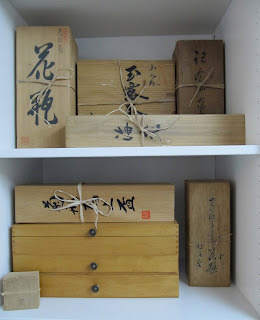 Beautiful post Donna :) My college age daughter is home and 'reorganizing' my recently unpacked cupboards. She calls my collections 'knick-knackity-dodgery-do's'. She says 'can't we put this with the other knick-knackity-dodgery-do's?' And she tried to get rid of the cowboy mug that was my father's. The one that he stole from his cowboy friend Gene! The nerve! 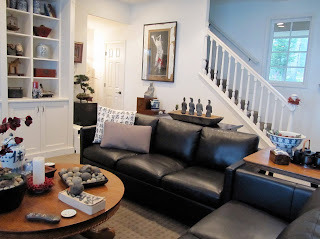 Donna, what a sensational post giving us a glimpse of your charming home, the serene Japanese influence seems to be everywhere. Thank you for the inspirational quotes and for the links to interesting sites, I am off to visit some of them straight away. It all looks so serene and calming. I love it. i have Sibella's book and it is inspirational. Still have not got through it all though. Great post. I remember a store in Oakland, Ca that had all sorts of bones, skulls etc and it was like going into a museum. Never purchase anything though. Wish I could remember the name. and there you were kindly providing a link! thank you. OK, we are all moving in. I will bring an ovenbord, promise. Beautiful and poised - truly an extension of you. 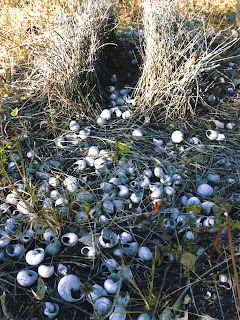 The Bowerbird nest. . . awesome, in the truest sense of the word. Your home is, too; even the TV remote looks like it belongs, peaceful and poised. Of course, if you were trying to sell your house, you would have to removed about 90% of the things that make it uniquely your home, according to my realtor. A timely post for me, Donna, since I'm clearing out all my hoardings. And finding the only way to let it all go is to close my eyes and say, "Take it, use it, make art with it." Always enjoy and look forward to your blog updates. Thanks for sharing. You have a carefully and artfully constructed interior. Thank you for sharing these photos and thoughts. Nature provides us with ample beauty, and your ability to organize it is remarkable. Glory be! 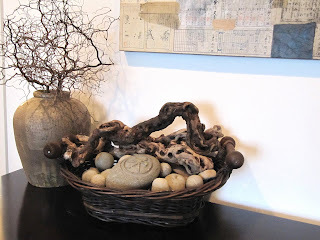 Donna this is a brilliant post filled with my favourite everythings including your decor. I've been trying to get Etcetera here but it hasn't arrived in South Africa yet. The images at the link you posted are making my heart race..... as are the photos of still lifes around your home. Thanks so much for sharing! Thank you visiting my blog. I just came over to repay the visit.Your post and your blog is wonderful. Calm.. 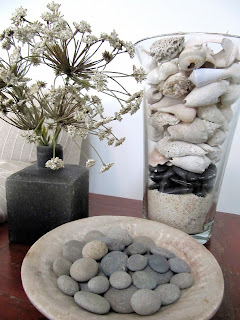 I love to collect and one thing I collect is rocks..
it feels like a deep breath! Thanks for the inspirational tour and all the lovely things to look at and interesting things to think about! what a gorgeous home! thanks for sharing it with us. your collections are so striking and beautifully displayed. wonderful post Donna! 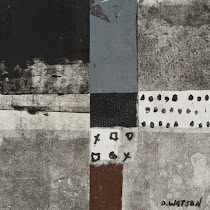 I think the reason artists are such notorious collectors of objects and materials is that it communicates to us so loudly one word: POTENTIAL! 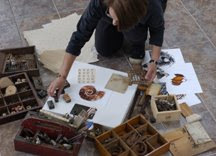 When confronted with so much raw material and art making tools, our imaginations can run wild. Visual stimulation like this gets our artistic juices flowing. I can see from your house that you've created a visually stimulating environment that must be a constant source of inspiration as well. I would be very comfortable and calm in your house> It's difficult to believe that you have so many collected materials, so calmly arranged. That takes a special knack. Beautiful post, beautiful home and beautiful work. I love the Stephen Calloway quote. 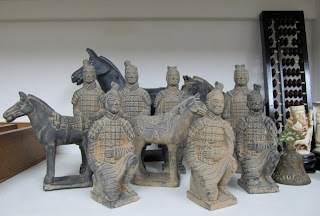 I also love the abacus, and bell amongst the warriors and horses in your studio. I too have natural elements throughout my home. They are a big part of how I decorate. The artwork hanging above your bed is incredible. 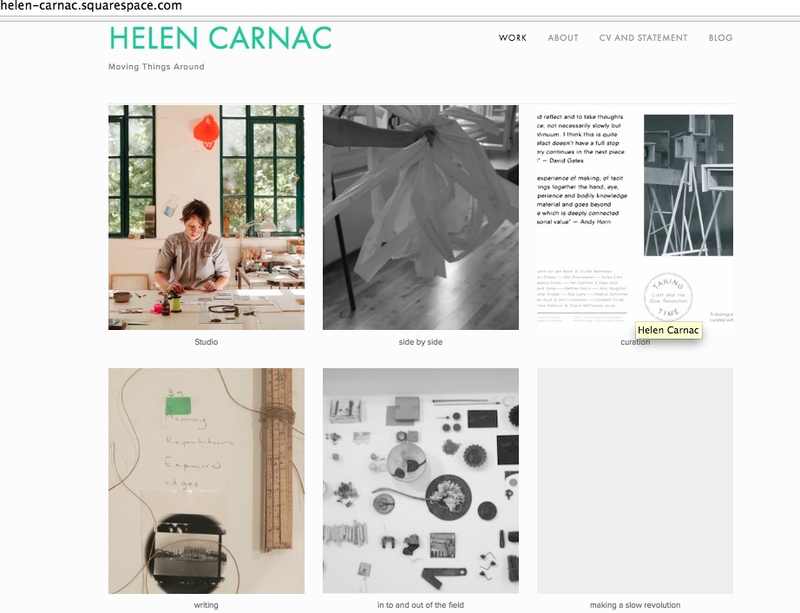 The bower bird, the book, the boxes in your studio, what a wonderful post! wonderful post as always, ms. donna. i would say i'm all of the above: hoarder, collector, etc. i adore all of the photos you share with us of your studio and home. it's gorgeous! all of the little scenes and perfectly arranged collections are just... perfect! off to check out the evolution store. you are such a gift!! and i feel that you are a "total connection" too (as expressed by graceann.) 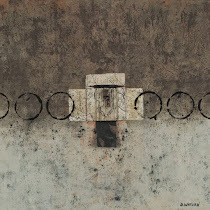 the authentic aesthetic of your art work and your home are in such accord! i might try to see gail rieke's work next summer in santa fe, and take graceann up on her offer to visit her studio this spring. sibella court's book is also on amazon, i just checked, and back i go to look further, deeper, TO NOTICE more!! I think we collect ourselves. Donna, your blog is beautiful and inspirational. I've added it to my Blog Reading List. 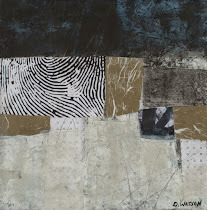 The acrylic and collage piece illustrating your post "To Plan or Not to Plan" is so nice. Thanks for visiting! WOW, so much eye candy here. I think I must have been a bower bird in a previous life, I see some wonderful necklace found objects in his nest. I totally agree with you about Sibella's book, one of my favourite one's for the year. Hi Donna, I'm glad I found your blog through Kathy Cartwright's blog. I've long admired your work. Seeing you're interior, it reminds me of the tone I see in many of your paintings. Understated but intriguing! Great post! You draw our attention to the fact that everything has a flip side. Another way I like to think about this, is our faults can sometimes be our greatest strength. So hoarder becomes collector. Procrastinator exhibits patience. And your house is simply an extension of your art, wonderfully composed in a tranquil and serene way, unique attention to detail everywhere. And my first thought was how I liked your work even better seeing it hanging life size. I think we all want to come and do a workshop in your inspiring home! Always amazing how rich your blog is with inspiration. Like a short trip to a wonderful museum. Btw: shall I put you on the paper swap list for January, 4? Geautiful post, Donna! Your space is so great! 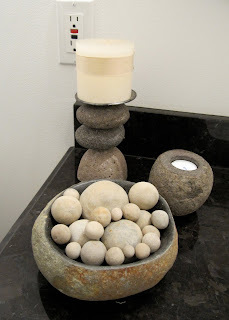 Ahhhh, each object in your home has been mindfully and artfully placed with meticulous attention to detail. Much the same as your blog posts are carefully constructed and positioned. You are 100% artful - inside and out and all around !!! Thank you for sharing your inner and outer visions Donna. It's always pleasing to view your style. loved seeing little intimate corners in your home. And yoru paintings! Love the one above the bed. I agree with what another commenter wrote- that your home is an extension of your art...or vice versa? Your surroundings and the art you make are in harmony- reflectins of their creator. Your home is truly a work of art! Oh what glories, what objects, what colours. Thankyou. Wonderful post, beautiful home, filled with little shrines of the things you love.You are obviously a Collector as opposed to me, a Hoarder! You also highlight quotes from some of my most favorite artists. 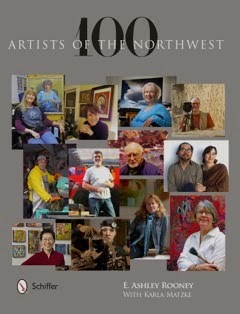 I had the pleasure to have spent some time with Gail Rieke in her studio and, well let's just call it nirvana!! Lovely post, Donna, so glad I stopped over for a visit and such a visit it was...collector, hoarder, stylist...good to think of them together. 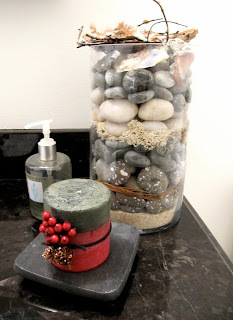 Love your stylish collection of hoarded rocks! Wishing you continued inspiration for 2010. Happy New Year! I love this post, traveled here from Leslie's post about the book Etcetera: Creating Beautiful Interiors with the Things You Love. 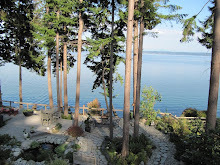 Really enjoy your posts... there is always such a peacefulness about your writing and images. Really felt affirmed today, in all my little collections... thanks for sharing. Such a pleasure getting to know you. One of my favourite posts. 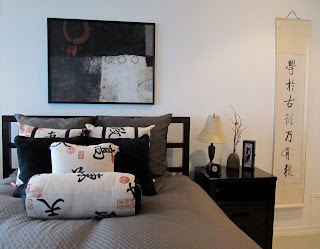 I love seeing your work on the wall in bedroom interior. I don't think I realized that you worked so big. Loving your new work on your website!